I’ve been scratching my head over toddler potty training. I mean, seriously, I know that they are eventually supposed to stop wearing diapers and be proficient at using the toilet. But what do you do to get it to happen? But lately, we’ve had some progress in the potty training department. It started over the weekend. 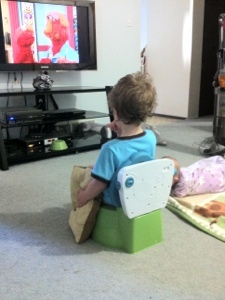 He’d voluntarily sit down on his potty while we were watching TV. Then it became keeping his underwear dry for a few hours. We also had the success of Norton staying dry for an entire nap in his diaper. His naps are generally three hours long. He’s been impressing his daddy by running back and forth to sit on both potties before taking his nightly bath. If he doesn’t use the potty today, there’s always tomorrow. Or the next day. He won’t still be in diapers by the time he gets to Kindergarten, right? A neurotypical child can safely be out of diapers for his first day of school? How did you go about achieving toddler potty training success? I’ve got two kids on either end of the spectrum: one precocious girl and boy with learning delays. What I’ve learned: you can bang your head against the wall, do jello shots, or watch Elmo till your eyes bug out of your head, but each kid does it in his own time. Ain’t nothing you can do to change that.